* even better news on the Bill Leak front this morning, as the Australian political cartoonist who went through two surgeries after hitting his head during a recent fall will soon leave intensive care. * Writer Mariko Tamaki is a finalist for a 2008 Governor General's Literary Award, as given out by the Canada Council of the Arts. 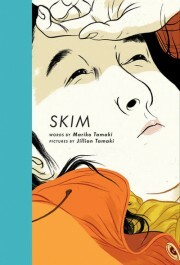 She was named to the prose children's author list for her graphic novel Skim. Guaranteed $1000 as a finalist, Tamaki could win $25,000 and a specially-bound edition of her graphic novel, while her publisher could win a few thousand dollars for another round of promotional activities. What's odd, of course, is that artist Jillian Tamaki (the writer's cousin) is not a finalist -- odd only in that in graphic novels as opposed to more standard illustration, the artists are in many circles considered co-authors because of the perhaps crucial importance of how the book is visually constructed in terms of how it's eventually read. * a Mike Carey-penned afterword to a collection of essay about Watchmen. * this article about Geppi's Entertainment Museum is odd to me because it seems to suggest that there's some sort of inability to pay while previous coverage emphasized the museum not paying because it wanted a deal similar to another tenant that forgave back rent due to outside factors. These aren't incompatible reasons, of course, you can be broke and not want to pay, but the emphasis seems to be pretty crucial here and so I can't quite figure out what's going on. To be honest, I can't imagine the museum bringing in enough money to offset that kind of rent on a regular basis -- Baltimore is stuffed with museums, both formal and odd, and it's hard for me to imagine a huge local audience for repeat visits to the place even with an aggressive exhibits rotation. * teasing a storyline death to an iconic character seems to me kind of a gross way to drum up interest in a comic book, but that's the mainstream American comic book industry, I guess. * ask Mark Millar a question. * finally, a couple of people have sent me links to this Tim O'Neil review of a Spider-Man comic. O'Neil is I think rightfully suspicious of a Spider-Man comic book drawing comparisons between Spider-Man facing down super-villains and the experiences of soldiers in Iraq, or any of the specific observations that are asserted in those issues. I also admire the ending of the piece where he basically admits he his mixed feelings on the matter. What struck me, however, is that it's comic book issues like these that I think feel the most impact from there being like six Spider-Man comics in a month. This just feels like something that's off in a corner somewhere as opposed to a BIG ISSUE in THE SPIDER-MAN COMIC BOOK. That's probably just me, though.